This Anniversary cupcake consists of chocolate cake with hazelnut buttercream frosting (nutella!!! ), chocolate sprinkles, Mickey Mouse confetti and a magical “25th Anniversary” medallion of chocolate. These flavor combinations are sure to be awesome! At the park you can find the cupcakes at Faifax Fair, Rosie’s All American Cafe, ABC Commissary, Starring Rolls Cafe, Backlot Express, Studio Catering Co., and Pizza Planet. 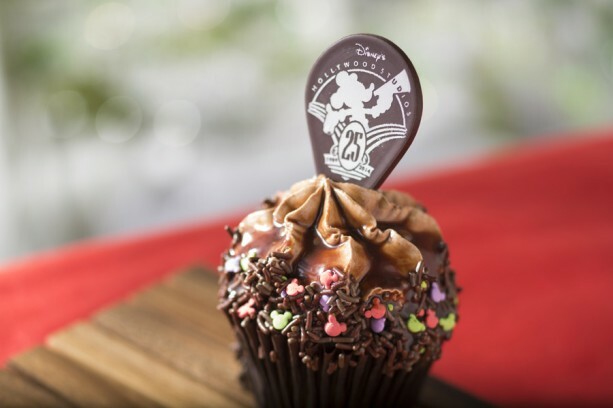 It’s $5.19 and the cupcake counts as a snack on the Disney Dining Plan. If you can’t be at Disney’s Hollywood Studios on May 1st you can get the RECIPE HERE to make it at home! Thanks to Pam Brandon for the recipe!!! « NEWS: Happy Silver Anniversary DH Studios!